After I finished Grad school in the late 80’s—earning a terminal degree in Painting—I moved to Chicago’s Uptown neighborhood. It was actually Buena Park but Uptown was just across the street to the north. I lived in a secure high-rise building with a twenty-four hour doorman. It was a “changing” area. On most weekend nights, the sounds of gunshots were a substitute for the crickets of my suburban upbringing. As I explored my new surroundings, I was intrigued with the graffiti-filled walls of the neighborhood. The paintings I had been making were nothing remotely related to Graffiti, but I was fascinated with the style, or maybe just the fluid shapes, use of color and dripping paint. And then there was the rush from the implied danger. Living blocks from the lakefront, I had this fantasy of publishing a “call for graffiti writers”—having them meet at Montrose beach park. I would supply them with all the required materials including stretched and primed wall-sized canvases to paint as they wished. 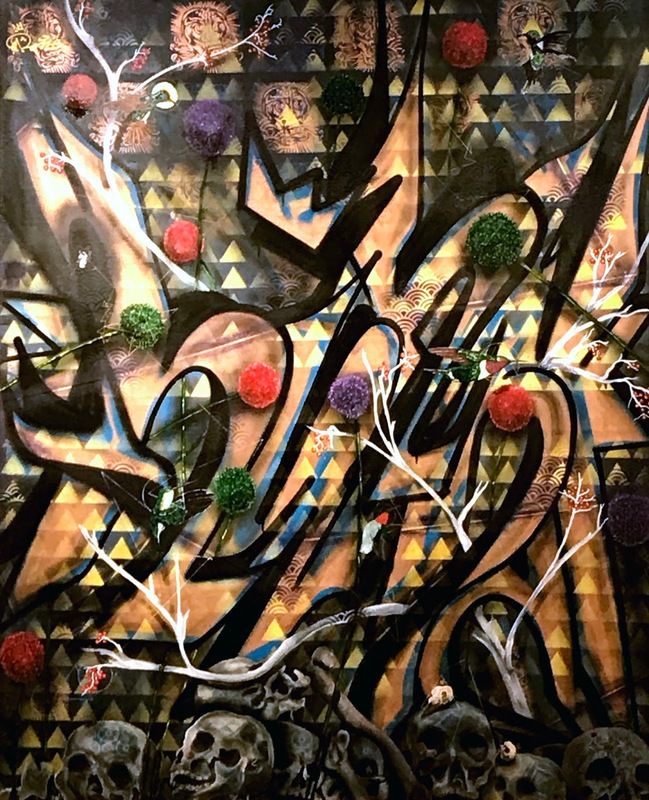 When completed I would arrange for the canvases to be exhibited in one of the high-end Chicago Galleries—elevating the perception of graffiti from vandalism to intellectual social commentary. Well, I never brought that idea to fruition but someone did. Unknown to me at the time, graffiti-inspired work had begun showing up in New York galleries—beginning in the 1980s. As I entered the Laura A Sprague Gallery of Joliet Junior College, memories of my past were triggered. 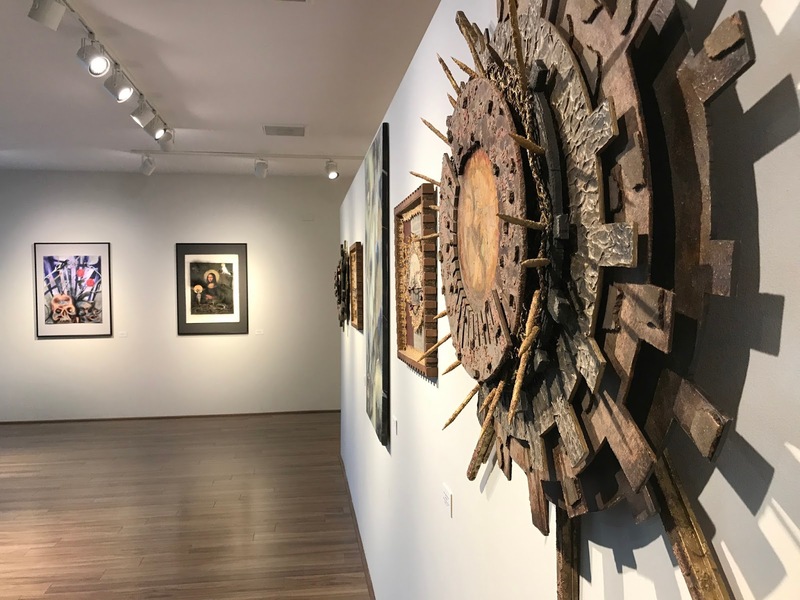 The current exhibition presents mixed media works created by Pedro Javier Palacios and Rodrigo Montoya Ortiz under the title “From Here – Desde Aqui”. 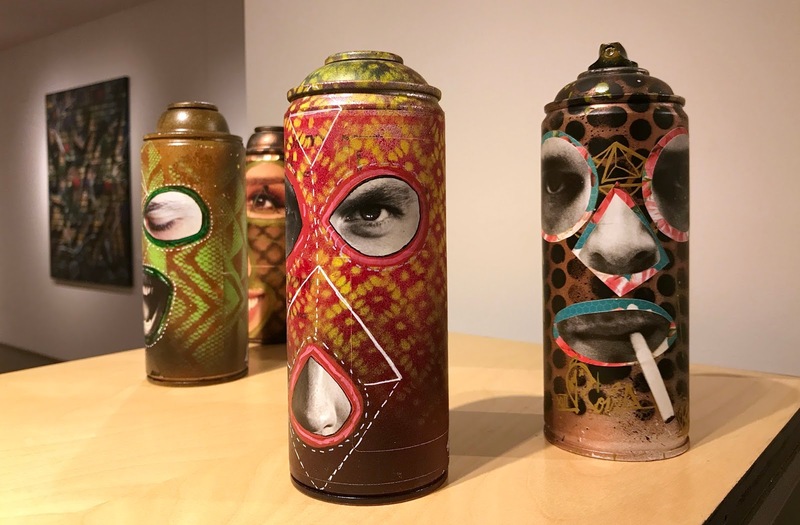 The pieces range from relatively large graffiti-covered canvases to smaller digital graphic explorations that seem to reference the timely subject of immigration reform. The objects within the exhibition include ornately decorated spray-paint cans and numerous wooden found objects laced with digitally reproduced drawings of religious iconography. This sort of found and re-purposed imagery is incorporated into most of the work on display. A quick read of the artist statements highlights the influences of graffiti, faith, nature and cultural heritage. The unique combination of these elements—within a single show—offer the audience an unusual challenge… attempting to decipher disjointed and fragile through-lines. The exhibition is an interesting collaboration with some beautiful—and unique—pieces. It should be explored unhurriedly. 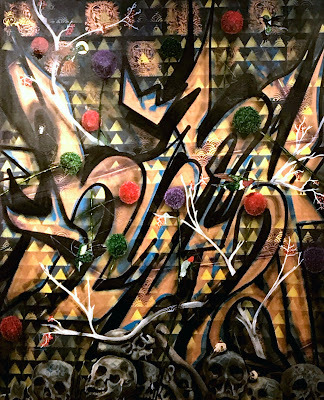 The opening reception of “From Here – Desde Aqui” will be held on Thursday, September 21st from 6:30-8pm at the Laura A. Sprague Art Gallery of Joliet Junior College. The Gallery is located at 1215 Houbolt Road, Joliet, Illinois 60431. The exhibition will continue through October 16th. Gallery hours are Monday through Friday from 8am to 8pm.